You already know that a deeper float bowl will only delay fuel starvation. Did you extend the pick-up, too? What fuel are you running? Thicker fuels may require a bigger petcock, filter, fuel lines, float jet, pick-up tubes or fuel pump. 4psi doesn't guarantee you've got enough flow. Is your pump running in a total loss electric system (weak battery?). Replaced (not cleaned) all your fuel lines? Fuel lines getting too hot? you may need to enlarge the fuel float needle/seat in the carburetor to get the needed flow rate....test it. 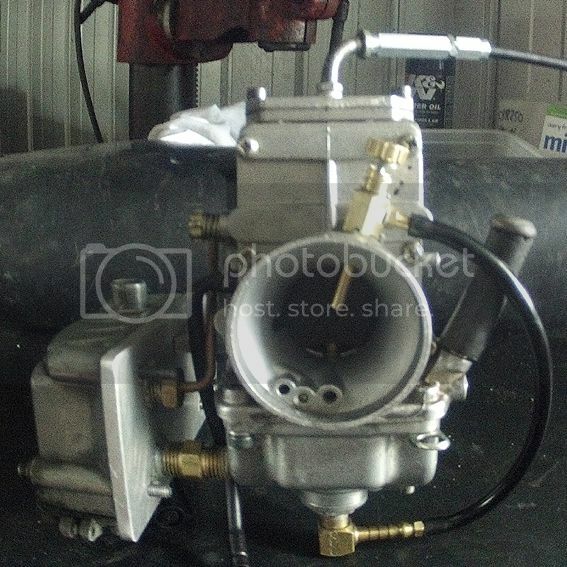 On blow through Carbs there is now a fuel bowl with dual inlets and float set ups. Have a look at Sumner's "formula" pages to work out your fuel supply needs (HP v's fuel required), then measure the flow out of the bowl cap orifice (after removing it) & see how the flow relates to your requirements 1st. If you have a flow problem, check out this needle/seat. high lateral Gs but it could also serve consistent float bowl levels at high fuel flows. Colsey cured his problem in time for Speedweek, extra float bowl ventilation was needed apparently? One of the reasons the British used a 360 degree firing order on their twins was that they had a single carb. There was the same time interval between "gulps" from each cylinder. It was easier to use this with a single carb setup 'cause each carb got the same amount of fuel mixture. The V-twin has an uneven firing order and one cylinder has less time to get its mixture out of the carb than the other. Also, it might be an advantage to run a richer mixture on the rear cylinder. Maybe the dual carb Mikuni setup might be the answer? These are just ideas from an "outsider." I have never worked on an H-D. I always had good results from the CV carb. Less finicky than a mik. Before you tear apart your carb are you sure your petcock is not starving the system? Sudco makes a needle and seat for pressure, used it on my Aerocharged Buell.